Because that would mean they REALLY knew their stuff back then, on par with our most modern ultra-high strength steels. And That would amaze me slightly, since they had not yet been capable of refining the necessary alloying metals. Or, maybe I just don't know what I'm talking about anymore, lol... Can anyone else shed some more light upon these things? "The hardness of armour baffles, for it is almost like glass; you can hardly scratch the surface of a good piece of armour with anything, yet it is not brittle like glass. Some sort of casehardening must have been used, though it is not known precisely how it was done. This hardness was important to plate armour in the most practical terms; it prevented a weapon from penetrating, for the smooth, hard, rounded, polished surfaces of armour were meant to make even the most powerful blows glance off. We read quite often in accounts of fights in the later part of the Hundred Years' War how even the English longbow arrows didn't penetrate the French warriors' plate armour, which developed in order to keep the longbow at bay, even when shot at close range. The arrows just glanced off. Even so, we do hear of shattering blows from axe, hammer, or sword that broke through plate armour." Now, I don't want this discussion to devolve into a debate about the effectiveness of the longbow, since I think arrows would have struck armour at an angle under most battlefield conditions, where the glancing surface would have been important. I just thought I would share Oakeshott's observations. Also, the book Longbow: a Social and Military History by Robert Hardy discusses the actual microstructure of medieval armour in the appendix "The Target" by Peter Jones. They talk about cold-worked 0.2% carbon steel having a tensile strength of 44 tons/sq in and elongation of 12%, quenched having a tensile strength of 51 tons/sq in and elongation of 14%, and slow cooled having a tensile strength of 30 tons/sq in and elongation of 35%. They show a photo of a German gauntlet X 500 exhibiting a quenched martensite structure, and a photo of a section of an Italian breastplate X 5 showing a carburised surface, and a photo of an English jack plate X 200 showing a slow-cooled ferric structure and hammer hardening. If I'm following this correctly, the "jack plate", cheap armour for commoners and retainers, exhibits the weakest structure. I hope this means something to you engineers out there; I'm just a former biology and health lab-tech turned author, and it's all "Greek" to me! Well thank you, Richard! For everyones info, higher elongations are equivalent to better toughness, in general. Low ones infer brittleness, but I don't recall the numerical ranges in practice. The 44 tons/sq.in translates into 88 ksi if an SAE ton is assumed, and the 51 tons/sq. in translates into 102 ksi. Even if metric tons were assumed, the figures would only be about 25 percent higher, and well under the 4-5 times the strength of mild steel brought up in the prevoius post by Daniel. Carburizing (ie; case-hardening) is only a shallow surface treatment, tending towards surface brittleness though. It does not have a huge effect on the overall strength, I believe. It creates a good bearing surface for long wearing items. Well hardness as measured by the Vickers Hardness test and tensile strenght are diffrent things, I'm not sure how far one can compare them. http://en.wikipedia.org/wiki/Vickers_hardness_test provides a basic description of the Vickers hardness test. VPH is the correct unit, not VPN as I misstakenly wrote in the earlier post. My numbers are taken from "The Great Warbow" by Hardy & Strickland who in turn quote Alan Williams masterly work "The Knight and the Blast Furnace" which is the most exhaustive and detaield work to be published on the metallo-archology of armour. "To put this in context, the hardness of modern mild steel is around 100 VPH, of unhardned tool steel around 250 VPH, and of hardend tool steel 500-600 VPH"
A total of 45 out of 72 specimens of marked north Italian armour dating to 1340-1510 tested by Alan Williams were of hardened steel, especially those dating after 1440, and ranged in hardness between 300 and 400 VPH. Of 23 specimens tested from Augsburg and Insbruck, dating between 1640 and 1510, 15 achived a hardness between 400 and 500 VPH. The point I'm trying to make is that just because a material is "modern" it isn't necessarily superior in performance to the the "unmodern" material used in actual medieval and renaissance armour. There is a significant difference between untreated modern mild steel and the hardened steel armour turned out by the workshops in Augsburg and Milan. Regarding the 1572 armour whose weight I quoted it is entirely possible that it wasn't shot proof, merly labled as such. Fraud involving substandard armour was not an uncommon crime despite being serverly punished if detected. Europäische Helme is a great resource for helms, covering the Bronze Age through the 20th century. It lists weights for all 298 helms and hats it pictures. It's really a great resource. Although I've been a passive member of this forum for some time now, I'd like to join you on this subject. I was very pleased to read Richard's post on weight and thickness of armour. I was wondering if any of you guys know anything about the weight and thickness of (late) fifteenth century Great Bascinets? I am part of a dutch, burgundian re-enactment groups who does, among various things, jousting. We have currently undertaken a project to extend the tournament to include proper footcombat as well. Because of this we will be needing different armour and we are currently doing research but I just can not find any information on the thickness of these things. I was hoping that you guys could point me in the right direction. Daniel, that new information is very helpful! By the way, it just so happens that there exists a direct correlation between the levels of heat-treatments, the Vickers, Brinell, and Rockwell hardnesses and the tensile strengths of iron alloys. Charts are available that let you determine actual material strengths from hardness tests, as this is done instead of full destructive testing on a finished piece. The extent of damage in this way is limited only to the small test dimple. There are several tables of 17th C breastplates along with weights, but not thicknesses, in the RA's Arms and Armour Vol 2, No.1 (2005), pp.5-26. It is a very interesting article about "duplex" plate. Armour made from plates of two or more different types of steel, forge welded together to improve resistance against firearms. The weights in the first table (30 entries) vary from 2813g to 4700g. A majority of them have proof marks. 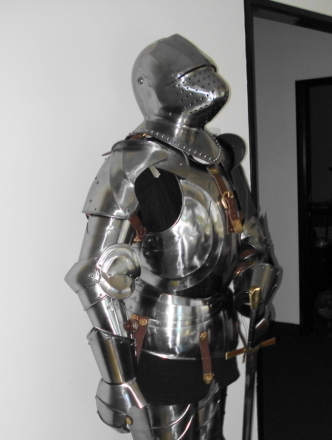 As a comparison, my Milanese Gothic style cuirass weighs just a hair under 20 lbs with 4-5 lame faulds. It's a metric equivalent of just over 18 guage mild steel construction. You must be a larger man than I. A cuirass of similar coverage built entirely of 18ga for me wouldn't weigh anywhere near 20 pounds. My own cuirass, with all its tassets, weighs 22 pounds, but is substantially thicker. The lower breastplate is 14ga, the upper breastplate is 16ga, the lower backplate is 16ga, the upper back is both 16ga and 18ga, the front fauld is 16ga, the rear fauld is 18ga, the front tassets are 16ga, and the other tassets are 18ga. Cuirass from Armour B4 (comprising upper and lower breast & backplates, frontal fauld, and tassets...missing rear fauld): 18.26 lbs. It is worth noting that these would be slightly heavier if they had their missing parts restored. Several similar cuirasses from Churburg are even heavier. And I recall Jeff Hedgecock saying that the cuirass of the "Avant" harness in Glasgow was 2-3mm thick or more through the breastplate after he'd gotten to take it apart and examine it with Tobias Capwell. I'm 6'-0'' and 170lbs with a 32inch waist! I weighed the breast- and back-plates together, without tassets, on an expensive name-brand digital scale of 150lb capacity with accuracy in metric units to 1/10 of a gram, and the total weight came to about 19.75 lbs. This is a new scale used in a small parts manufacturing facility, and is frequently tested as such, so the accuracy should be very reliable. The average thickness looks to be about 1.2 to 1.5mm, not counting all the doubled up areas. Sorry if this information doesn't fit into your view of things, Josh. A common mistake that many people make is that medieval armor was heavy. Compared to the equipment that a modern day US Army soldier carries, a medieval soldier would be carrying a much lighter load. Unlike the uneven weight distribution of a modern-day soldier's equipment, the weight of the armor was distributed evenly so that the knight or other armored soldier could fight without hinderance. However, the only problem from wearing armor is that it got very hot. I have also read that many medieval armored soldiers died after having to cross a very cold river, although it is more likely that they died from overperspiration than from the cold water. It was possible for a person wearing full plate armor to be able to swim, although they would move very slowly. It has also been stated that some knights could even dance in plate armor, and some could even do acrobatics, although the acrobatics is probably farfetched and was done by those wearing very lightweight armor. No it isn't far fetched. Plenty of re-enactors with properly fitted plate armour debunk Victorian myths about plate armour weight by doing jump jacks, cartwheels, rolls, etc. Could anyone please put relative weights of different parts of mail armour? Such as what proportion of the weight of a hauberk would be for example chausses, mittens, aventail, and coif? There are dozens and dozens of different types of mail. The heaviest types weigh 2-3 times more than the lighter ones and there are many ways of tailoring it to vary the coverage of different body parts. Which type were you interested in? If you want a rough approximation for a game or novel then take a look at GURPS Low-Tech. Armour weight was calculated by using the Wallace Rule of Nines. The surface area of different parts of the human body can be determined by using multiples of 9. You can see that torso armour would weigh the same as leg armour and that arm armour is half as heavy. So you determine the total weight of the armour and apply the above multipliers. Then round up to allow for overlap between different armour pieces and you are done.